You’ve just created a webinar and have gotten great engagement. You’ve optimized your registration page and the emails have been sent. But when you look through your registrant list you notice that most of the registrants are people who are already leads. Although webinars are a great way to nurture leads further down the sales funnel, you also want to use them as a way to start your relationship with new leads. This article will break down exactly how you can do that with Facebook Advertising. The impetus for this article started when we examined our own webinar registrations and kept noticing names we recognized. We looked into it and noticed that a full 74% of our webinar’s registrants were existing leads or clients. We needed a way to drive first-time registrants to our webinars. Facebook Advertising has filled the gap in our strategy and helped our last webinar campaign see a 458% return on ad investment. Our efforts also more than doubled our first-time webinar registrants (at last count). Facebook Ads are ideal for webinar promotion because of their unparalleled ability to reach your target audience. And when I say target audience, I mean the biggest ad audience in the world: 829 million active users logging in 13 times every day. Your first-time webinar registrants are on the platform, we just have to go and get them. On average, only 15% of your webinar registrants are people new to your business. That means (if you’re using webinars for lead generation) that 85% of your energy is wasted. Facebook Ads can expose your brand to the largest audience of possible first-time leads and customers the world has ever seen. Using Facebook Ads to promote your webinar is like having an influencer in your sector recommend you to hundreds of thousands of Followers. Suddenly you’re on the world stage, and the number of possible customers explodes. Lead-generating and free content does well with Facebook Ads, as the platform lets you reach the right people at the right time. This is in direct contrast with Google Adwords which (while great for B2C and general business promotion) isn’t the greatest for free content, as people generally do not search for webinars, ebooks or other lead-generating content - let alone search for it at the exact moment you have a webinar coming up. Another great thing about Facebook is the size and specificity of the platform itself. Facebook’s huge ad audience and unparalleled targeting will allow you to promote your webinar to 240,000 small-business owners who have (for instance) publically stated an interest in customer relationship management. Imagine how effective it would be to promote your webinar on “CRM for small businesses“ to that targeted audience? Even without considering the brand awareness increase, targeting that audience with a Facebook Ad will generate about 240 people to your landing page. Not bad for an ad spend of less than $100. This means the price of a click or impression is based on how much other advertisers are willing to pay for your target market. Think of it like the real estate market: if the home you want to buy is in the coolest, trendiest, most up-and-coming area of town then you have to be prepared to spend a tidy sum. However, if you’re satisfied with living in the older, bit more rundown side of the river, you can offer less for the home you want. Your target audience is on Facebook a lot (about 13.8 times/day according to recent data), which means they’ll be exposed to your ad a lot. To combat overexposure, watch your ad’s frequency and click-through metrics. When the frequency starts getting higher and CTR lower, rotate your ad. You need to create an Ad that encourages people to engage with it. If you don’t have a good Ad, you’re going to be wasting your money no matter how well you target. You need to design your Facebook Ad with conversions in mind. Ensuring your ad gets seen and engaged with is like the difference between the Coca-Cola brand and generic cola at the grocery store. They may contain the same content, but Coca-Cola is the billion-dollar business. Facebook’s color scheme is blue and white. Because of this, an ad that is predominantly white with a blue image won’t get as many clicks because it will blend in with the background. It’s essential to create a professional image of yourself for your Ad. Consider the lighting, background and clothes you’re wearing when taking your picture. Check out this resource on how Wishpond creates a kickass video(it all works for images just as well). You don’t have a huge amount of space to sell your webinar in a Facebook Ad, so keep it tight and optimize with best practices in mind. FREE - This word gets people to convert by lowering barriers to entry. People will be more likely to join your webinar because there is little risk and commitment needed. Exclusive - This word helps make the person feel like they’re going to be part of something special and only for them. Avoid - This word communicates that you’re going to help them stop doing something negative. Learn - Since we are a naturally curious species this word helps push us further and also communicates value. Facebook is strict about it’s 20% rule of Facebook Ad images (only 1/5th of your ad image can be text), but that just means it’s essential that you put time into making your copy shine. Test an image that causes Facebook users to have a double take. Don’t think you’re locked into using a photo of your webinar host or an attractive model. While these have been proven to work, you may find as much (or more) success with an odd or surprising image. Your Facebook Ad is competing with picture of your audience’s nephews covered in spaghetti and their cousins on vacation in Barbados. Make it stand out from the crowd with contrasting colors (reds, yellows), value-oriented words like “Free” and images of people. You have to give people a reason to click on your Facebook Ad. Use words like “exclusive”, “free” and ensure you’re framing it in terms relevant to your target audience. Consider phrases like “save my seat” to communicate exclusivity. There are variables of Facebook Ads that will actually decrease engagement, many of which may seem like best practices initially. Avoid glaring colors which, while catching the eye, do so by being ugly. Facebook Ads are so easy to A/B test it’s crazy. Test changes to your image, colors, copy, CTA and target audience. Run the tests with the same budgeting at the same time and see what resonates after 48 hours. Switch your ad budget to your most successful ad to maximize ROI. Explore “More Demographics” targeting to find people based on job-title, employer, income, education, relationship, etc. Targeting people interested in buying a new house is very expensive, so try a work around. Instead you can target people who were recently married. It’s likely that a significant portion of your Ad audience will at least be thinking about new accommodation. 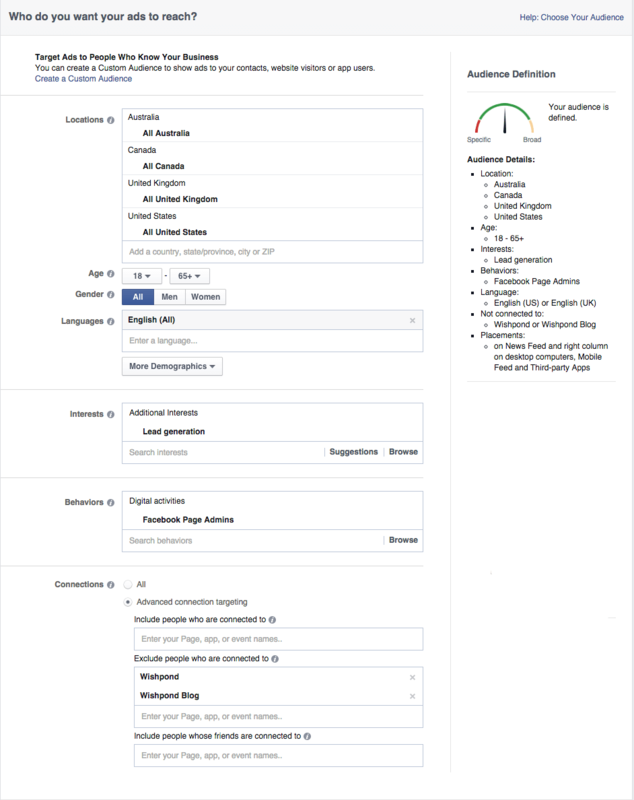 Testing your image, copy and target audience is incredibly easy with Facebook’s Ad Manager (or Wishpond’s). Doing this will maximize your Ad ROI, ensuring you’re putting your budget into what is most useful - the Ad that generates the most clicks. Some images resonate more than others with your target audience and it’s someitmes difficult to predict what that image will be. Your image will likely be a combination of text overlay and an image of your webinar host. Test your host’s eye-direction. Does your audience respond to an eye-gaze directly at the audience or looking toward your ad’s value proposition? Test a colorful border around your ad image. Does green, orange or red work best? If you have multiple webinar hosts, is it better to only feature one of them or both? Once you’ve tested how to best grab the eye of a Facebook user, you need to tested the copy they see. You need to be telling them what they stand to gain and what to do. Test “Free” in caps or at the beginning of your copy. Does this give value or is it too cliche for your circumspect audience? Test different variations of your ads with different user segments to determine what resonates most and what delivers the best ROI for your business. Test if a certain image of your webinar host is more receptive to men than it is to women. Test if a certain message appeals more to a middle management segment than it does to upper management, or visa versa. Test limiting your ad’s target audience to only 60,000 Facebook users and then upping your ad budget, thereby ensuring your ad is shown to everyone and also honing in on a specific segment of users. 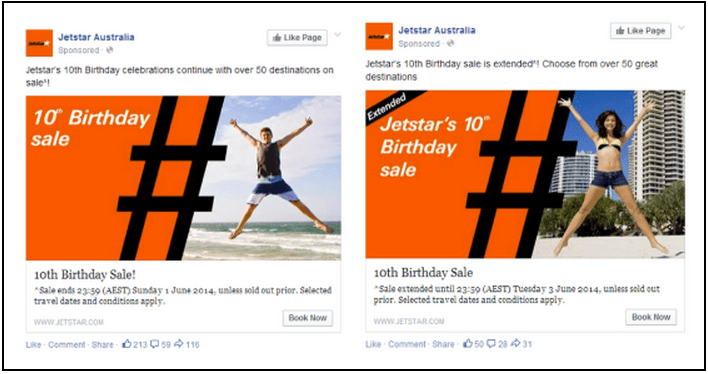 You’ll notice small copy changes (like using “Jestar’s 10th Birthday sale is extended” vs “Jetstar’s 10th Birthday celebrations continue” as well as well as the change to the model’s gender. This is one of my favorite a/b tests, and one of the simplest ad optimizations a business can make. Target members of both sexes with images of both sexes to see if your click-through-rates are affected. A landing page A/B test for international delivery service DHL pitted a female model against a male one, and resulted in a 25% increase in lead conversions. Another found a 15% increase. 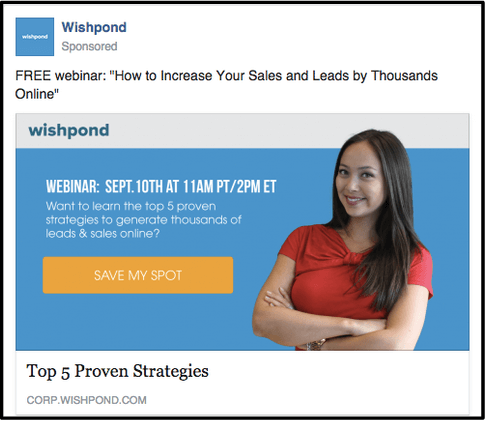 Hopefully this article has given you a better grasp of how Facebook Ads can work to promote your webinars (and your business in general). 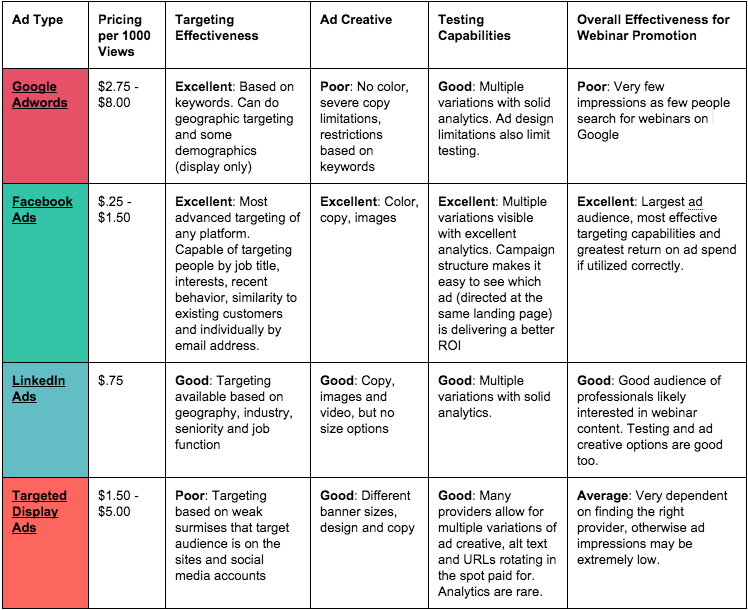 I’d like to emphasize the need to a/b test your ads, as the smallest changes (and least effort) can result in huge changes and improvements on your campaign’s ROI. Also, who doesn’t like going to their boss and saying “This idea I had resulted in a 458% increase in new leads for our webinar campaign”?